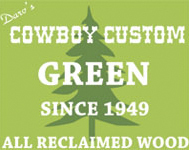 What: Darv’s Cowboy Custom Western Furniture. Where: Brewster Barn, 35476 Brewster Road, Lebanon. When Darv and Sheila Averill picked up stakes and headed to Lebanon two years ago, it was to relax and spend time with their grandchildren. 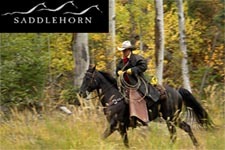 And maybe dabble in the custom furniture making that had made them a pretty well-known name in Montana. But just dabble. It worked for a while. There was some relaxation and plenty of time for the grandkids but eventually the lure of what had sustained them for more than 30 years brought the Averills back into the business world. It’s easy to see why. The Averills run Darv’s Cowboy Custom Western Furniture out of their nearly 80-year-old barn on Brewster Road just outside Lebanon. The huge two-story wood barn now holds Darv’s uniquely styled tables, beds, lamps and more. Doubling as an antique store, Brewster Barn is gaining the attention of local customers very quickly. Only operating at full bore since December, Brewster Barn features a small workshop where Darv pieces together his wooden treasures and a showroom for his creations and the numerous antique fixtures the Averills have added. Darv grew up on a dude ranch in Montana and helped build lodges and cabins, and the furniture that went inside. He developed a rough-hewn sense of woodwork that he’s perfected over the years into more than 100 designs. His work has sold internationally from his original studio on a ranch in Big Fork, Mont. Now he’s back at it, although for the moment, in a scaled back operation. He works with wood that is either recycled or reclaimed. Darv harvests dead or fallen trees, gets wood from dismantled barns, and takes in wood from friends and neighbors who are looking to get rid of material from dilapidated structures. Darv has collected wood from all over his properties in Oregon and Montana. He turns it into sturdy, useful pieces for homes. His furniture includes items made from cherry, maple, oak, myrtlewood and even a fallen sycamore he salvaged from his Lebanon property. 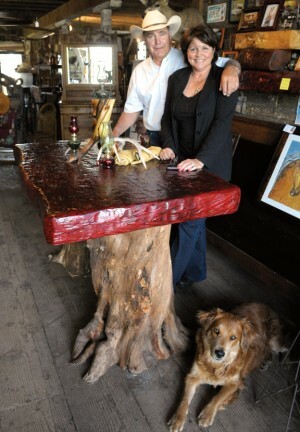 In the barn he displays items that include different colors, textures, sizes and woods. Many include intricate designs he fashioned with his chainsaw. Sheila says people have been dropping by from all over the valley, which she is hoping will build into a strong clientele. “I think more people are starting to come back to custom-built products. It was down for a long time in this economy but they seem to be ready to get back to high-end items,” she said. They currently have two full-time employees, one of whom, Gary Coakley, does all the leatherwork for the business. Much of the sales from the Brewster Barn are online, where the original business grew worldwide. Even so, the Averills have plans to expand. A nearby bunkhouse is scheduled to house more items and Sheila says they will offer a variety of activities at the site, including speakers and artisans. An open house is set for Saturday, Aug. 20, and will have live music, food, a quilt show, and demonstrations of cowboy skills, including Darv’s favorite, roping.Â He’s a five-time state calf roping champ in Montana. “It’s been a good move here. People couldn’t believe we would leave Montana but this is great,” Darv said.